It's vital to have a clear idea of how your item performs because the performance has a great impact on your marketing strategy, therefore, on your marketing efforts and ultimate margins. Being the most popular data analysis tool, Google Analytics can help you collect visit info of your target items all for free. With the help of Google Analytics, you can track the performance of your digital magazines. And from the collected statistics, you can know which parts are doing well and which are not; you can have an idea of what is attractive to readers and what is not. Thus, you can adjust your marketing strategy to maximize your marketing effort. Pub HTML5 will not only help you convert PDF files to amazing digital magazines, but also enable you to embed your Google Analytics to analyze the visit statistics of the online digital magazines. 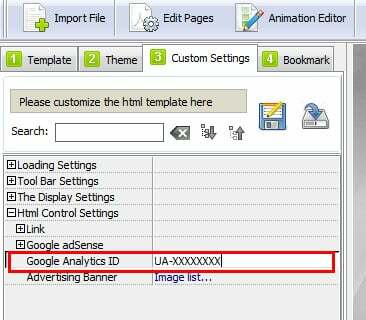 How to Add Google Analytics to Digital Magazines with Pub HTML5? 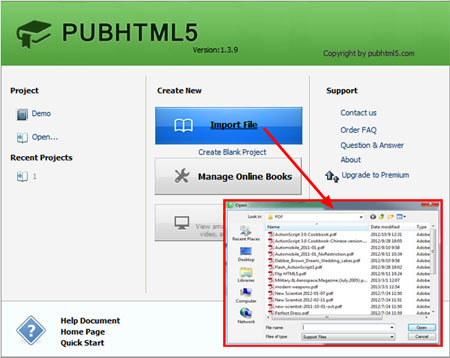 Launch Pub HTML5 and click "Import File" to import your PDF document. After you import the PDF, you can customize the magazine in the Design Interface. You can select a template and a theme, change logo, show or hide the feature buttons, embed media such as video, YouTube, Vimeo and audio. In the Design interface, click "Custom Settings" tab, and under "Html Control Settings", you will see "Google Analytics ID", click it and input your Google Analytics account and click "Apply Change" to save the setting. You can publish the book to local and upload to your server, or click "Upload Online" to publish the digital magazine to our Online Hosting directly. And after you publish the digital magazine online, you can login your Google Analytics to monitor the visit statistics of your online magazine.